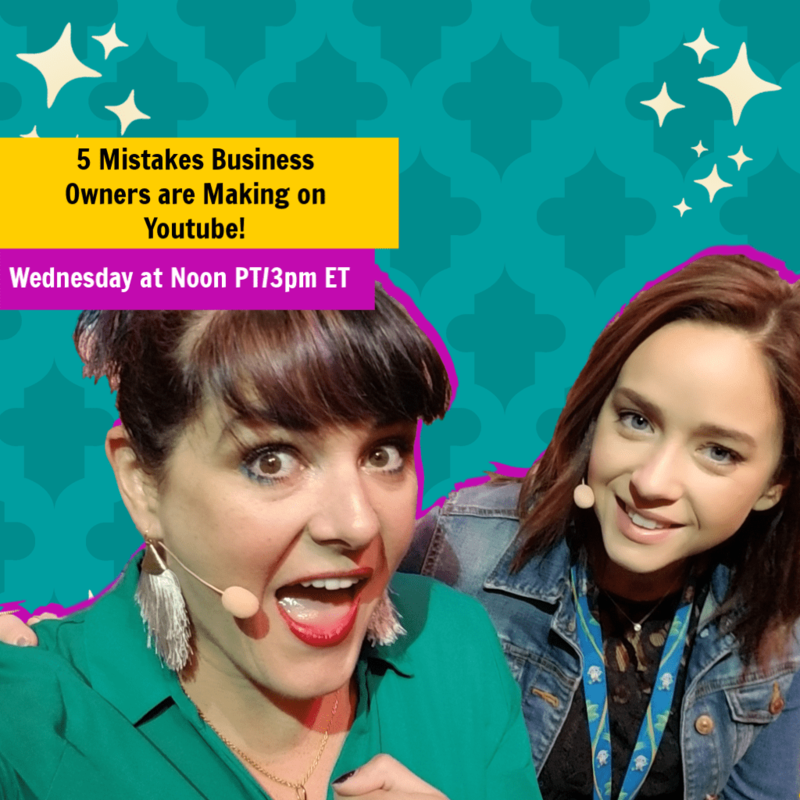 Amy Landino shares her YouTube Magic! 1. Cover Photo – Get this done well. It is the showpiece for your channel. 2. Name of the Show – Pick one that resonates with your audience and has good SEO. 3. Thumbnails – See below for more detail on thumbnails. WaterMarks – Stamp on your videos for branding. Thumbnails help you brand better. Be sure the thumbnails on the video itself are of similar branding to your channel. It creates a visual brand for your channel. There is your channel branding and then there is your Thumbnail branding. Thumbnails need to be similar to the channel. Thumbnails in YT are similar to Facebook. Pay attention to them. Remember that if you are going live at a certain time… Promote it. Let people know. A video a week is recommended its the industry standard. Don't load a bunch of videos at once… I have more detail in the next section as well. But if you starting out and don't have them… what do you do? Amy Landino says… make playlists. When you start out so there is content on your page and it is not a Ghost Town leverage other people's videos and make playlists of them. Curate content of videos you like and recommend. Make playlists for when people come to your channel. Why do this?… YT loves people on your channel and your job is to keep them there longer. This helps to keep people on your channel. If they start watching on your channel… and stay on the YT platform… YT likes that. Even if the next video they watch is not yours… YT likes they are on your channel/their platform! So if you only have a few vids at first, like when you start, and people don’t leave… you get rewarded by the YT algorithm. The quality of your channel matters so much. These playlists increase the quality of your channel. Sooo have a playlist of other content you like that is aligned with your brand and the content that is coming in the future. Fill the white space on your Channel's page with enough for a full page on a desktop (like one page view when they land on your channel… or “above the fold” as it is called). You don’t want white space. Don't worry, it is not a lot, this is basically 4 lines or videos or playlists. So your first video and 3 Play lists does it! Read the next section to know how to populate your page. What you need to do is be patient. Load only one video at a time. Don’t load multiple videos at once to “populate” your page. Amy Landino shars the industry standard is 1 video per week. And the first 48 hours. This is another industry standard thing. You are shooting yourself in the foot if you load multiple videos at once. Loading a bunch of videos, that nobody watches in the first 48 hours of uploading, will flat-line your stats on all those videos! Yikes!! Say it isn’t so!! Here is the rule: One video per week is the industry standard! Yup! once a week is what is normal for YT. Let each video get engagement. YT wants to see growth and improvement on your videos. Soooo, post once a week… and promoting the video BEFORE to create engagement! Have patience!! This is the biggest key here. I will say it again, have patience!! For example, 10 videos will take 10 weeks if you do it properly. There is no quick fix. Have patience. Be sure you stand the test of time. Those who give up too early, don’t make it on YT. They don’t have the patience to get to know people. If you want to use videos to replace building relationships one on one … you can but you have to be patient. Videos enhance one on one relationships. When you go to an event and meet in real life… people feel like they know you already. It is really cool. In fact Amy's husband is now getting recognized at events! That is fun!! Let's spend more time on this. Amy Landino says give yourself time beforehand to promote your upcoming video. Why? YT tracks the key metrics during the first 24 to 48 hours after uploading a video. Do views compare to your previous releases of same, better or worse? So… when you upload a video onto your channel, you want viewers to show up in the first 24 to 48 hours. How do you do that? You have to PROMOTE your channel and video releases. A: “All” you have to do… is upload videos for the 8 years beforehand!! That is about 400 episodes! That's all! Here is the math: 1 a week for 50 weeks x 8 years = 400 Episodes. Have it so people come to your channel and just can’t leave… because you have so much content… and such great content!! Do yourself a favour and stick with a theme on your channel. Again, think about how the YT algorithm works. YT would love to make money on you. So they watch what you do and either reward you… or don't reward you. Do a series of 3 to 5 episodes. Anything less is not sustainable. Anything less and the algorithm can’t tell what your content is about. Anything less and you are doing yourself a disservice. Do a “Strategic Series Test”. Do 3 to 5 videos on a topic or theme to test on your audience to see if they like it. Decide what do you want to be known for? Leverage what you want to be known for. Prove you are good with that thing. If you bounce around, YT can’t categorize you. It hurts your growth and it slows or halts identifying your speciality. YT needs to be able to “figure you out”. So, know what you are talking about so you can leverage the algorithm. You want easily identifiable content… for the right people… so the algorithm can promote you. If you create categorizable content… they will reward you! It is that simple. Videos need SEO text on then… the algorithm “reads” not “watches” your video content meta data. Title – Pick a title that both grabs attention and is SEO friendly – like people are searching for it. Description – Write a description that matches your title and expands on it, and has what people are searching for. Tags – put keyword tags in the tag section of the video metadata. Amy Landino has a couple of videos that did really well. This was the piece she made the next video. This series now began to see a trend. Pay attention to the metrics/numbers… think “What does my audience want to see next?” Build a series from these insights. Glean from watching your numbers and pay attention to your audience. If you are building a relationship with them… this is easy. Remember as I always say… be a real human. Treat your audience like real humans. When you do this, creating a series of 3 to 5 videos is easy… and the YT algorithm will reward you for it. Putting your newly created video everywhere… is similar to being impatient like we talked about above. You upload… are NOT patient… then decide to upload everywhere else! Do you realize you need to customize content for each platform?! Don’t upload that same video elsewhere! Each platform has its own unique things about it. YouTube is different than Facebook… is different than Instagram… is different than LinkedIn… each are different, so the content and format should be different. Get to know how the given platform works and the special things about it. Think algorithm. Amy Landino says, you want as many eyeballs as possible on your new video on YT in the first 48 hours!! This way YT will reward you. If you upload elsewhere… you dilute eyeballs! This new video and the views you bring to it… is what you demonstrate to YT you can bring to THEM… YT then, turns around and based on the algorithm says, here is what we can do for YOU to help you grow. If you upload everywhere else… you have no reason to promote your YT channel. No-one will click on it if they have already seen it elsewhere. What Amy Landino suggests is to invest in a Hub for your content. Whatever that hub is. In this case, it is YT. Focus and dedicate your attention and resources to knowing that platform and do it well. The context of the platform matters a lot. So, know what that context is and create your content around it and let the platform do its thing. A “view” on the YT platform is counted as 30 seconds. It can depend on how long the video is. Like if your video is really short 2 minutes or less the count will be less than 30 seconds. People click into your video by choice. Audio and video turns on at the same time… this is good. Then they make a choice to stay or go in 8 seconds. The experience on FB and YT is very different because on FB this decision is in about 3 seconds. These nuances are the things you need to know about the platform. How did they find your video? Where is search traffic coming from? Treat the camera lens… as if it is a person. Pretend you are having a chat with an actual person… the camera, even if it is just a tiny dot on your cell phone… treat it as if it is a person. This one tip alone helps you to not be a talking head. You will warm up in your videos and connect more with your audience. Feel whom is watching your videos. Ignore the camera and connect to real HUMANS! !